← Which James Bond Movies Actually Had You Convinced Bond Was in Danger of Being Killed? 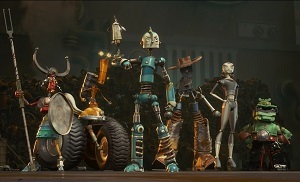 Remember Robots – the most generically titled animated film until Cars came out the following year? I skipped it when it first came out because if the title was that uninspired I was sure the rest of the movie wouldn’t be much better. My wife picked Robots out of a bargain bin at Wal-Mart a while back and I forced myself to sit down and see what it was all about. It turned out to be a pleasant surprise. My expectations for Robots were extremely low. I thought it would lack imagination and the story would be dull. I knew it had a lot of famous people in it, like Ewan McGregor, Robin Williams, Halle Berry, and Mel Brooks, but that is not a guarantee that the movie will be any good. But soon after the movie started, I discovered that it was much cleverer than it needed to be, and the world it created and the story it told are expansive and well thought out. Robots is a manic movie that is fast-paced and yet knows how to quiet down from time to time and breathe. I like pretty much all of the characters, even though none of them get a whole lot of development. What you see is what you get with this movie. It doesn’t feel the need to be deep, and that’s fine because it embraces what it is: 90 minutes of pure fun and worldbuilding. The late Robin Williams famously did the voice of the Genie in Disney’s Aladdin. That was a brilliant performance, but it relied heavily on celebrity impersonations and pop-culture references that haven’t all aged well over the past two decades. 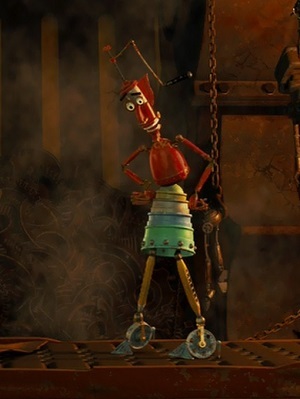 His character did have a nice emotional story of obtaining his freedom, but other than that I would argue that Williams’ portrayal of a robot named Fender is at least as good, if not better. Fender is so funny, spouting off one-liners that rely much less on pop culture and more on just straight comedic timing. They also feel more organic. I mean, it’s funny to see the Genie impersonate Jack Nicholson, Arnold Schwarzenegger, and other celebrities, but he’s in ancient Arabia, so no one but the audience would understand what he’s referencing. In Robots, though, his barrage of references makes sense because he’s a defective robot drawing on lots of experiences from his world, so the other robots can just accept him for who he is and still understand what he’s talking about. Williams really elevates this movie, just like he did with Aladdin. The main characters are all underdeveloped, but that doesn’t really matter because we’re never more than one scene or two away from Fender’s hilarious antics. Keep an eye out for when he gets a new bottom half of his body. That had me in stitches. And they milk that joke for all its worth through several scenes, all of which are incredibly funny. There are so many scenes that blow me away in this movie. When Rodney (the main character) and Fender get thrown through the city in a giant metal ball, it’s both thrilling and informative about how this robotic world works. They don’t have a complex set of tubes to transport people from part of the city to another, like in Futurama. 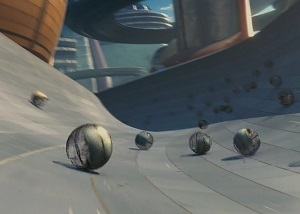 They throw metal balls through the air and have them sail down half-pipes at breakneck speeds, demonstrating what a cavalier and yet controlled environment it is. There is method to all of the madness. The scene where Rodney gets magnetized and has to run for his life from giant pieces of metal following him down the street is also awesome to watch. That kind of gag has been done before, but seeing it in this world where everything is metallic makes it feel like something we’ve never seen before. The fight/dance sequence between Rodney and Fender is beautiful and hilarious at the same time. They’re fighting tooth and nail and yet their movements make it look like they’re engaged in an elegant ice-skating performance. Pure genius. The scene where thousands of dominoes fall and cascade into a tsunami is creative, and it’s a grand introduction for Bigweld. There are so many other parts of the film that stuck with me, but you really just need to see them to understand how amazing they are. Don’t let me convince you that Robots is perfect. It’s good enough to make me overlook its flaws, but they’re still there. The love story is extremely weak. The love interest never has anything interesting to say or do. The villain and the hero inexplicably vie for her affections, but she’s not intriguing enough for us to care who she ultimately winds up with. I felt the same way about Astrid in How to Train Your Dragon the first time I saw it. Her relationship with Hiccup seemed to come out of nowhere in the second half of the film. But over time I noticed all of the subtle things the film showed us in the first half to explain why she would care so much about Hiccup. A lot is left unspoken between them, but they still have a surprising number of scenes together. In Robots, there is no romantic subtext. It’s just a lackluster part of the film. 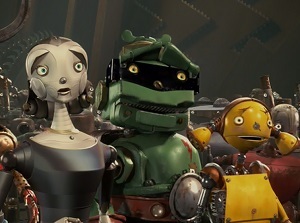 Bigweld’s change of heart near the end feels sloppy. It’s nice to see him finally fight for the underdogs, but there is no explanation for his leaving in the first place, which makes his reason for coming back terribly weak. The fake-out at the end where we’re supposed to wonder if Rodney and Bigweld are dead is particularly clumsy. So many things are happening in the climax that it’s impossible to focus on what happened to those two. When everything gets quiet and the other characters look intently at a pile of garbage, I find myself feeling like I must have missed something. 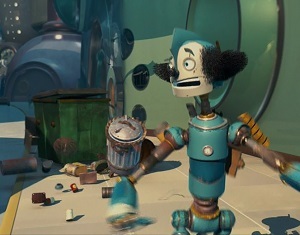 Then when Rodney and Bigweld emerge from the garbage, I feel underwhelmed. I knew this wasn’t the kind of film that would ever kill them and they already survived far worse falls than this, so the attempt at suspense was pointless. Fortunately, they do keep it brief. If you haven’t seen this movie, I highly recommend it. If you’re looking for an obscure Robin Williams movie to enjoy, look no further than Robots. It’s a fun adventure that has numerous funny lines, sight gags, and jokes that will have both parents and children laughing and wanting more. This entry was posted in Pleasant Surprises and tagged animated films, comedy, films, funny, humor, movie review, movies, robin williams, robots, science fiction. Bookmark the permalink.